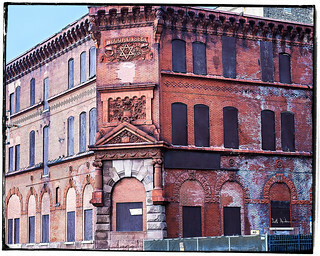 My brother lives next door to the old Schoenhofen Brewery on W. 18th st. near Pilsen. I've often wondered about the now-shuttered facility -- how busy it was and what they produced there. A quick internet search reveals some websites stating that Schoenhofen was once one of the largest brewers in the Midwest, which even had its own spring supplying fresh water to the operation. Another site mentions something about how federal agents seized the brewery during WWI because members of the Schoenhofen family were broadcasting radio messages to Germany from the brewery's tower. Any truth to this? Curious City paired up with WBEZ's Strange Brews podcast to answer this question about suds and (unfounded) suspicions. Among the rumors Strange Brews quashed about the Pilsen neighborhood's noted Schoenhofer Brewery: Did it broadcast messages to the Germans during World War I?